Every day that I wake up, I seek to fulfil the purpose of my life, believing that each day will be conquered. One must remember that the present is a gift and I urge everyone not to take that moment for granted. If life is sour, make it sweet and your responses will impact many. Rest assured that like other negative conditions, यह भी गुजर जाएगा ("This too shall pass"). Being an artist has many advantages that bring about good and positive change. On a personal level, I am able to revel in creative pursuits with no boundaries. In regards to the viewer of my works and audience, I aim to bring about not only beauty, but a deep sense of calm. I combine meditation and art which I believe has the ability to not only increase one's concentration, but through the process, it can bestow ideas that seem to come from a Higher Power. Creating art to utilise all levels of consciousness is my purpose. I want everyone to have an experience of joy when looking at my art. For this reason, I have focused my inner efforts on my latest Mantra Collection, in honour of International Yoga Day. I want people to be able to use my artworks as mantras to retain focus and peace in not only their yoga practice but also their daily lives. In a world that seems to move at a quick pace, art as therapy could be viewed as cliché, but we do sometimes need to look at something beautiful with no clear practical function in order to nurture our souls. Having lived in both the USA and India, I have absorbed the extraordinary and vibrant cultures of these countries. The USA, to me, is the land of freedom and dreams and hope is a valued concept. This really struck with me in my formative years and I witnessed how great and diverse a country America was. Being home in Chennai, India feels like medicine needed for my evolvement. India has an epic history that is so inspiring with many traditional scriptures and teachings still being practised today. I explored the philosophies of yoga and meditation as ways to heal the Self and then brought that into my art combining the vivacity of freedom - expressed in my use colour - with harmony. Every soul is here on this beautiful planet in a quest for happiness. It is important to provide this to one another even if just for a brief moment in time. Like many others, I go through challenges and question myself, my process and my future. Through my art, I hope to bring about positive change to the inner soul because harmony comes from living in peace. Bhanu's influence, inspiration and passion for art is fantastically unorthodox. 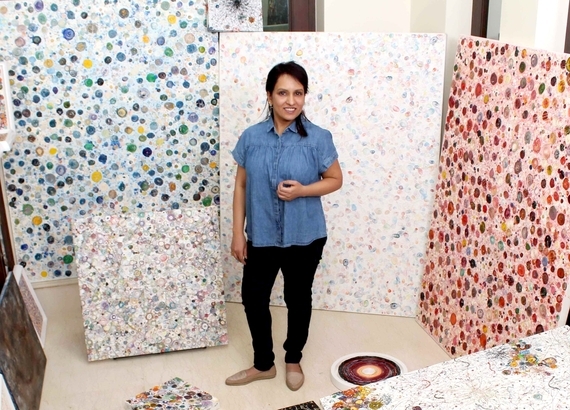 A natural and never-ending need for Bhanu to simply 'create' is evident in the sheer volume of work she produces - creating almost a piece every day. Born in Gudiyatham, India, Bhanu has the heritage of India ingrained in her. She is greatly influenced by the Indian textile and henna tradition in her works and uses industrial paint to create texture-indulgent creations, taking inspiration from the delicate swirls of henna to dynamically transform her canvas into an intergalactic microcosm. Bhanu relocated to New York at a young age, and recieved a Certificate in Contemporary Art from Sotheby's Institute of Art in 2012. Bhanu has exhibited her works internationally, from Art & Soul Gallery in Chennai, India to Thomas Erben Gallery in New York, and the Taubman Museum in Roanoke, Virginia.